Social media technologies can help connect local communities to the wider world. 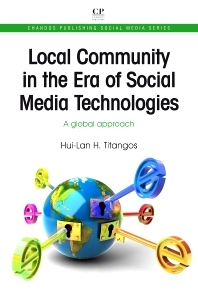 Local Community in the Era of Social Media Technologies introduces the experience of bringing a local community to the world. This book, with the model of Santa Cruz County, California, develops a truly global approach to the subject. The first section of the book covers the early efforts of recording the local Santa Cruz area, before moving on to deal with Library 1.0. The next section looks at the present situation with Library 2.0 and its benefits. The book ends with a discussion of future directions and the implications of Library 3.0 and beyond. Hui-Lan H. Titangos is Reference/Access Services Librarian at Santa Cruz Public Libraries. She holds a Graduate Certificate in Information Management and an MLIS from the University of California at Berkeley. Her previous experience includes working for The DIALOG Corporation, Pacific Neighbourhood Consortium, and Shanghai Filmmakers’ Association. She came to Santa Cruz in 1989 and fell in love with its landscape, and most of all, its people. She is the author of five working papers about Santa Cruz published in journals and publications, such as Library Management and Chinese Librarianship.